"This week's story came to us via an e-mail that asked us to catch up on the Maine's One-to-One Laptop Program. "The program began in January of 2002 when Maine signed a four-year, $37.2 million contract with Apple Computer, Inc., to provide iBook laptops to every seventh and eight grade student, and their teachers, in the state. In 2006, the contract is up and the state must decide whether to keep the program or not. "We've tried to answer those questions in this report." School Laptops: Save or Delete? "If you have cruised the laptop aisle of an electronics store lately, you've probably noticed that nearly all the models on display sport wide screens like those on large-screen televisions. But if you work for a corporation or in government, you're not likely to see a widescreen model around the office. Do consumers know something corporations don't? "They sure do. Over the past couple of years widescreen displays ranging from 14 in. to 17 in. have come to account for the great majority of laptops sold in the retail market, which includes consumers and many small businesses. But when it comes to the enterprise, the three big makers of business laptops, Dell, Hewlett-Packard, and Lenovo, say that most information technology buyers won't even consider widescreen designs. "The reasons are murky. Part of it seems to be the resistance to change that corporate IT managers show in all sorts of decisions. Part seems to be based on the assumption that the only thing wide screens are good for is playing DVDs - and corporate laptops are for work, not fun. "I was converted to the virtues of wide screens when I began using Apple PowerBooks. These were among the first popular models with screens whose width is 1.6 times their height, versus 1.25 times for a conventional display." "Hwang, however, had a different revolution in mind - the revolution in data storage through NAND flash-memory chips. The nano uses flash chips rather than a hard-disk drive to store its 1,000 songs, and Samsung, the world's biggest maker of flash chips, has a contract to supply most of them. Using the less bulky flash chips - which don't run on mechanical parts and retain data even when a device's power is cut off - made the nano's ultra-thin shape possible. It will replace the bigger, hard-drive-driven iPod mini. "One potential future market is in notebook PCs. On Sept. 12, Samsung unveiled a prototype notebook that contains a 32-gigabyte flash drive...."
PR: Samsung Electronics Co. Ltd. brings to market new 2.5" high-end Serial ATA hard disk drives targeted for notebook and enterprise computing applications. Samsung's latest drives, the M40S Series, are offered in three capacities including the 40 GB HM040HI ($80 estimated street price), the 60 GB HM060II ($100), and the 80 GB HM080JI ($140). All three new drives are currently shipping. "Samsung prides itself on being a technology leader and as one of the first major manufacturers to offer Serial ATA technology in the 2.5" hard drive format. Samsung continues to up the ante and provide consumers with a wide variety of high-end storage solutions," states Albert Kim, National Sales Manager, Storage Systems for Samsung SSI. "The new M40S series gives enterprise and home users alike the ability to use best-of-breed Samsung technology for their corporate or mobile computing needs." Ideal for notebook PCs and for enterprise applications such as blade servers that require small form factors with the benefits of Serial ATA technology, the M40S Series drives feature 8 MB of onboard data cache and high performance 5,400 rpm spindle speed. All mobile drives offer outstanding throughput performance and competitive power consumption rates. The new drives provide outstanding reliability and industry-leading shock protection capability through an advanced mechanical platform and robust cover design engineered to minimize the intensity of external shock transmitted to the most critical components of the drive. The M40S Series features outstanding quality. Samsung invented a revolutionary new latch mechanism that eliminates the unpleasant rattling noise of traditional 2.5" drives and significantly reduces the clicking noise generated when a drive moves its heads on and off the disk according to the operating modes. The drives use a Fluid Dynamic Bearing motor to achieve industry-leading operating acoustic noise levels. Samsung's latest 2.5" hard drive offerings feature Fluid Dynamic Bearing Spindle Motor Technology, ATA S.M.A.R.T. compliance, ATA Automatic Acoustic Management and ATA Streaming. To ensure the quietest drives in the industry, the M40S series utilizes Samsung's patented NoiseGuard and SilentSeek next generation technology. PR: Combining the long distance and high speed capability of the QuickerTek Transceiver with a PC Card offers PowerBook users real value. Especially attractive for titanium PowerBook users who have an older AirPort card, any PowerBook user who wants to step up to 802.11g speeds also gets improved wireless performance. This 250mW QuickerTek Transceiver and the 802.11g Buffalo PC Card 54g is $250 from QuickerTek dealers. This small Transceiver is not much larger than an antenna, clips temporarily onto the PowerBook case, and is easy to travel with and easy to pop on and use where ever mobile Mac users go. It connects to the PowerBook through the Buffalo PC Card - just like an antenna. It's ideal to use a full-speed connection at large public areas such as airports, college dorms, expansive offices, hotels, outdoor commons, and can't seem to connect at any tolerable wireless speed. The Transceiver offers 250 milliwatts of RF power. For comparison, the titanium PowerBook has 30 milliwatts of RF power. It's easy to see why the Transceiver can not only connect to distant wireless networks, but also get a full-speed connection. This Transceiver/PC Card Bundle is not designed for iBooks or the 12" aluminum PowerBook. Like most QuickerTek products, it's backed with a one-year warranty on parts and labor. Rick Estes, president QuickerTek, Inc. stated, "The Transceiver PC Card Bundle is perfect for PowerBook users who seem to always be in one of those places where you can see a network, but the signal strength is always frustratingly slow. If you have have one of the older PowerBooks with a slower AirPort card then this Bundle will give you the latest 802.11g speed and long distance wireless you lust for," said Rick Estes, president, QuickerTek, Inc.
QuickerTek is a recognized leading innovator of antennas and RF products for Apple desktop and portable computers. QuickerTek products can be purchased at Mac dealers such as Small Dog Electronics, TechnoWarehouse, PowerBook Medic, DayStar Technologies domestically, as well as a growing number of dealers in Europe. PR: Digital Foci's Picture Porter portable digital photo album with hard drive and card reader lets you instantly and securely save and view digital photos and video on a hard drive wherever you go, so you can keep snapping away and not worry about running out of memory card space. Especially valuable for vacations, trade shows, special events, parties, and for pro photographers who take and show a large number of photos, Picture Porter saves photos on its compact portable hard drive, so you don't have to bring heavy laptops on the road. 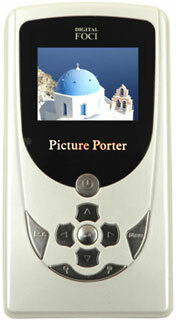 Picture Porter takes the worry out of losing precious photos stored on easily damaged memory cards. Its built-in memory card slots let you copy and archive photos directly from any digital camera card, without the need of cumbersome cabling. With Picture Porters' compact 20 GB and 40 GB hard drive versions, you'll virtually never run out of memory card space on the road again. With USB 2.0 High-speed computer connection, Picture Porter lets you transfer files to and from your computer with ease. Use Picture Porter to back up and archive digital images, digital music, and important files from you computer. With its high-capacity hard drive, you can now carry your collection of digital photos and video with you all the time right in your pocket and view them anywhere you go on Picture Porter's bright 2" color LCD screen. With Picture Porter, you can rotate, zoom, pan your pictures, view EXIF information, and play picture slideshows for friends. You can even connect Picture Porter to a TV and share your photos and music with family and friends on a big screen in the comfort of your living room. Picture Porter works with all media card formats, including CF I/II, MD, SM, MMC, SD Card, miniSD, xD-Picture Card, Memory Stick, MS PRO, MS Duo, and MS PRO Duo, so you can copy and save your precious pictures directly from any digital camera memory card. You can also make yourself copies of photos taken from friend's and family member's digital cameras by quickly inserting their cards into Picture Porter for instant archival of special picture moments. Picture Porter is also perfect as a portable MP3 and video player - keep your entire content collection in one place for easy access. Bi-directional data transfer lets you copy files directly from any memory card to the Picture Porter hard drive and vice versa. In addition, you can easily transfer files to and from your computer and between computers with different operating systems through its high-speed USB 2 connection. High-capacity Lithium-Ion battery allows 3.5 hours of continuous video and 7.5 hours of continuous music. Compatible with Windows and Mac operating systems, Picture Porter is compact and lightweight weighing only 8.6 oz (with hard drive and battery included) with dimensions of 5.2" (L) x 2.8" (W) x 1.2" (H). It comes in 2 stylish colors: frosted white and graphite and 2 storage capacities: 20 GB and 40 GB. Picture Porter comes complete with Ulead management software (normally a $70 value), USB cable, video/audio cable, earphones, AC adapter, Lithium-Ion battery for 3.5 hours of video and 7.5 hours of music, remote control, carrying case, and user's guide. Picture Porter is backward compatible with USB 1.1. There is no software driver installation required for Windows XP, Windows ME, Windows 2000 (SP3 or later) and Mac OS 9.x or later. Simply connect Picture Porter to your computer using the USB cable included in the package. 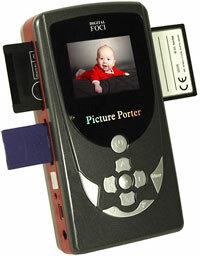 Once connected, Picture Porter will show up as a removable hard drive. You can use it just like you use the hard drive on your computer. It is available immediately at Digital Foci's online store $399. PR: Giuseppe Tribulato's MenuExtra addition FastAndSlow adds the ability to switch PowerBook, iBook, and iMac G5 processor performance (in the Energy Saver settings) from the menubar. You can select between "fast", "slow", and "Automatic" (if your computer supports this setting). It is useful for example when your Mac becomes too hot and the fan starts. Using the slow setting it doesn't happen. Added "Read me first - français" documentation. Fixed a bug on Tiger 10.4 that used to prevent the FastAndSlow menu extra from displaying the current settings correctly when switching to a default power profile using the Energy Saver preference pane. (Thanks to Byron Shaheen with MacPRO for software testing and for the French localization and documentation). System requirements: Mac OS X 10.1 or later, PowerBook,iBook or iMac G5. refurb 15" PowerBook G4/1.25 GHz, 512/80/SuperDrive, AirPort Extreme, $1,599.